CALLISTA Yacht Charter - Let’s sail ! CALLISTA Yacht Charter - Let’s catch fish ! CALLISTA Yacht Charter - Let’s do it all ! CALLISTA Yacht Charter - Let’s explore! CALLISTA Yacht Charter - Let’s hike ! CALLISTA Yacht Charter - Let’s tube ! CALLISTA Yacht Charter - Let’s jump ! CALLISTA Yacht Charter - Let’s eat ! CALLISTA Yacht Charter - Let’s go caving ! CALLISTA Yacht Charter - Let’s hang out ! Min Child Age: 6 yrs. Captain Roland and Chef/ First Mate Vanessa, both vibrant and energetic, hail from Cape Town, South Africa. They have known each other for 20 + years and were married in February 2010. Roland’s first transatlantic blue water passage in 2004 brought him to the shores of the Caribbean. It was during one of those yacht deliveries in 2005 that Roland came across Tradewinds Cruise Club and worked as a Charter Captain managing a Privilege 48 Ft catamaran in and around the Caribbean windward islands, operating primarily out of Jolly Harbour in Antigua, going on to work with Vanessa on numerous and larger catamarans for Tradewinds Cruise Club in 2012 and then into the private sector in 2013. His other passions include kite surfing, cycling, scuba diving, free diving and fishing. In 2010 Roland and Vanessa decided to put their individual skill sets together. They sold their respective businesses and embarked on a plan to work on yachts full time. They contacted Tradewinds Cruise Club with whom Roland has had a long standing relationship. The rest as they say is history. Both growing up in South Africa has taught Vanessa and Roland to appreciate and indulge in numerous outdoor activities, whether it be hiking, skiing, river rafting , kayaking or scuba diving to name a few. Vanessa and Roland are both qualified PADI Dive Master/Rescue Diver’s. Roland is a qualified PADI OPEN WATER INSTRUCTOR and will be offering Discover Scuba Diving for non certified divers onboard SV CALLISTA ! Their guests can be sure they are in very safe hands ! There is NO certification on a DSD course. In addition Roland is an instructor in wreck, deep, navigation, drift, Fish ID , nitrox scuba diving specialities. Vanessa is a trained ASHTANGA yoga instructor. The flavour of Roland and Vanessa’s charters lends itself towards getting off the beaten track, finding paths less travelled but also feel very comfortable offering an itinerary which includes lively beach bars and popular locations. They are open to lifestyle charters of more than one week thereby allowing the freedom to island hop. The grill is utilised a lot, providing a healthy outdoor style of food preparation and still managing to retain a feeling of luxury. Roland is a South African citizen and Vanessa carries both British and South African citizenship. Their home language is English however speak fluent Afrikaans. Both are non-smokers. Roland and Vanessa feel very strongly that 3 crew provide a higher level of service, responsiveness and speed. They are joined by a 3rd crew member, deckhand/steward Hugh White, from Pretoria South Africa. Hugh is a well mannered active young man who is a keen sailor having done two Atlantic crossings and obtaining his Yachtmaster Offshore. He is also an avid scuba diver with his PADI Rescue Diver Certification. Hugh also loves water-sports and is always ready to take guests out for a ride. Hugh looks forward to continuing sailing and furthering his yachting career. •Note there is a shade over the foredeck area on CALLISTA. Equipment - Two trolling rods with a 50 pound test line with high end Shimano reels plus 2 casting rods. Roland is a PADI Open Water Diving instructor with diving insurance including public liability. Roland is also qualified to teach O2 delivery, Nitrox specialty, Deep specialty, Wreck specialty, Navigation specialty, Fish ID specialty, Drift dive specialty, Night dive specialty courses. Wet suits, if desired, need to be rented. In locations where the vessel is required by law to make use of rendezvous diving/local dive operators, this cost will be for the guest account. •SONOS Music system is available in 4 zones, saloon, cockpit, fly bridge AND fore deck. 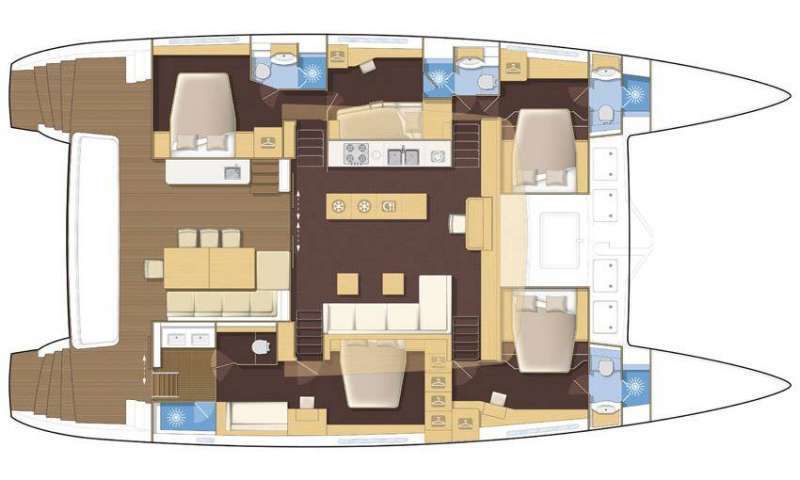 Listen to different music choices at different volumes in 4 different areas of the yacht. •We have a 110V transformer on board. •CALLISTA has a medical kit to MCA coding. •CALLISTA welcomes tandem charters but for safety reasons no overnight rafting will be possible.